I am trying to post a picture of a clematis for identification, how do I get it small enough for the site to accept it????? Everything I have tried so far is too big, getting very frustrated!! 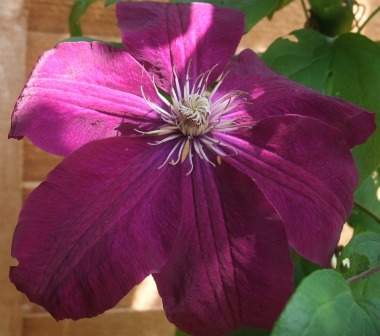 At last I have managed to do it, amyone have any idea which clematis this is??? We moved into a new,to us, hose in April. A fence panel had been replaced and a couple of weeks later I noticed the clematis poking its head up. I can only assume it got trampled when the panel was replaced and cut down. I guess it is a summer flowering one, so will need to be pruned after flowering???? or does it need to be cut down in the spring? I think your plant is Clematis 'Rouge Cardinal'.